An educational resources and information technology centers specialist. He holds a Master's Degree in mass media from the University of Cairo by e-learning system. Komsan currently serves as Chief Operating Officer for SchooPedia.com (educational digital library won GESS Dubai award 2016). 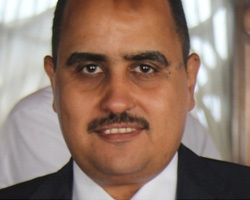 He formerly served as Executive chief in Editor of Moheet the Arabic media network and Director General of the Media Documentation Centre in Cairo.